A comfortable and spacious family transporter with some serious muscle, the 2017 Toyota Sequoia in Evansville is a top choice among traditional body-on-frame SUVs. Built on the same platform as the Tundra truck, the Sequoia boasts top-notch performance capabilities and a silky smooth ride quality, plus all of the benefits of a full-size, three-row SUV. To find out if the Sequoia is the right choice for your family, continue reading our 2017 Toyota Sequoia review below. The Sequoia is a flexible choice for families, offering seating for eight passengers and up to 120.1 cubic feet of space with the rear seats folded down. 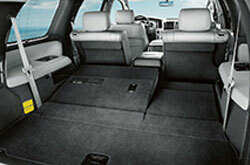 The SUV also comes in SR5, Limited and Platinum trims, each outfitted with a host of comfort and tech features. The base SR5 is anything but entry-level, showing off foglights, 18-inch alloy wheels, a sunroof, a roof rack, heated exterior mirrors, a power rear window and rear privacy glass on the outside. 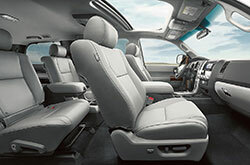 Inside the spacious cabin, the SUV features an eight-way power driver's seat, a sliding/reclining second row, tri-zone automatic climate control, Siri Eyes Free, Bluetooth, a USB port and more. Higher grade trims add more available equipment like second row captain's chairs, a Blu-ray entertainment system and a 14-speaker sound system. 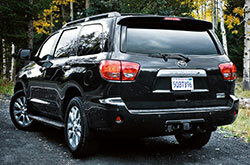 A 5.7-liter V8 engine "helps the Sequoia accelerate with authority," according to The Car Connection's 2017 Toyota Sequoia review. Pumping out 381 horsepower and 401 lb.-ft. of torque, the powerplant is paired to a capable six-speed automatic transmission and can go from 0 to 60 in an impressive 6.7 seconds. Tow capacity on the Sequoia ranges from 7,100-7,400 lbs., depending on the drivetrain configuration. Rear-wheel drive is standard, but those who frequently travel across rockier terrain will want to upgrade to the four-wheel drive option with low-range gearing and a locking limited-slip differential. Additionally, an electronically modulated air suspension is available on Platinum models. Safety equipment on the 2017 Toyota Sequoia in Evansville starts with an advanced airbag system, anti-lock brakes with electronic brake distribution and brake assist, stability and traction control, and a backup camera. A TOW/HAUL mode and trailer sway control are also standard, adding more stability and efficiency when towing. The SUV can even be had with smart cruise control, blind-spot warning, and front and rear parking sensors on select models. 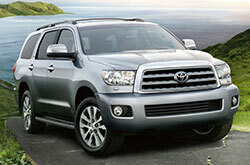 The Toyota Sequoia Is Here! In the market for the 2017 Infiniti QX80, Chevrolet Suburban, Ford Expedition and the GMC Yukon? You should also visit Kenny Kent Toyota to check out the enticing 2017 Toyota Sequoia and find out why it's a reputable option. The car's high-end in-car technologies and attention-grabbing styling could wind up being just what you need from a daily driver. Take advantage of our evaluation and try the compare tool to see if the 2017 Toyota Sequoia is a fit for your everyday needs; and then, check out finance incentives available at Kenny Kent Toyota. 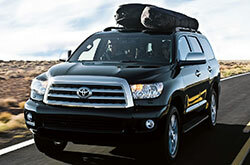 We're a local Toyota Sequoia dealer with up-to-the-minute lease offers on new and Certified Pre-Owned vehicles. After checking out our 2017 Toyota Sequoia review, make note of the specifications that you found helpful; they'll help you make a responsible vehicle purchase that you won't second guess. Locate the brand-new Toyota Sequoia at Kenny Kent Toyota, where you can be pleased with a test drive and view the model personally. 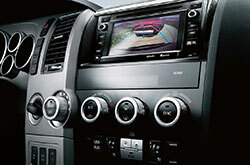 Can't wait to see its innovative cabin equipment in person? Check out our video now!